After four years of making dining a little more special on the other side of the mainland tracks, Michael and The Genuine Hospitality Group have decided to close Cypress Tavern. The American Grill & Cocktail Bar will serve its final dinner service on Sunday, April 30. The restaurant will remain open as a venue for private events. Book special lunches, dinners and more with that Cypress touch through Michael Schwartz Events at its new website michaelschwartzevents.com. Opened in March 2013 as The Cypress Room to immediate national and local acclaim, the restaurant was committed to celebrating an expression of fine dining the way it was meant to be, through the lens of Old Florida. With Frog’s Legs and Wood Roasted Bone Marrow whisked off the pass and smiles in the intimate, chandelier-studded dining room, warm hospitality reigned and mindfulness of the guest experience expressed itself in attention to detail and special touches at the mahogany bar. Enjoying recognition on Bon Appetit’s 50 Best New Restaurants List and 3 1/2 stars from the Miami Herald, The Cypress Room was a beloved favorite and “hidden gem” for those in the know who appreciated its vivid expression of spirit and sense of place, a nod to the past that sparked innovation and creativity in the kitchen — always balanced and stemming from respect of the classics — during its tenure on the outskirts of the Design District. Eater National’s Bill Addison referred to The Cypress Room’s “odd, wonderful formality” as not taking itself too seriously in 2014, something the restaurant further embraced when it was reborn as Cypress Tavern in the fall of 2015. “It’s never easy to close the book on a project you feel genuinely proud of, but our lease term is ending, and it’s time to move on,” Michael explains. “I owe so much to the teams over the years that have nurtured this place and contributed to it becoming so much more than we ever could have imagined. I’m humbled by the support we have received over the years from our guests. No decision like this is ever easy, but for us, it’s the right one. Especially in Miami, especially when it refuses to cool off (patience! ), we crave the winter vibes. We break out the brown liquors, reds with structure, and yes, the meat. It just feels like the right thing to do and indulging is always more fun with friends. 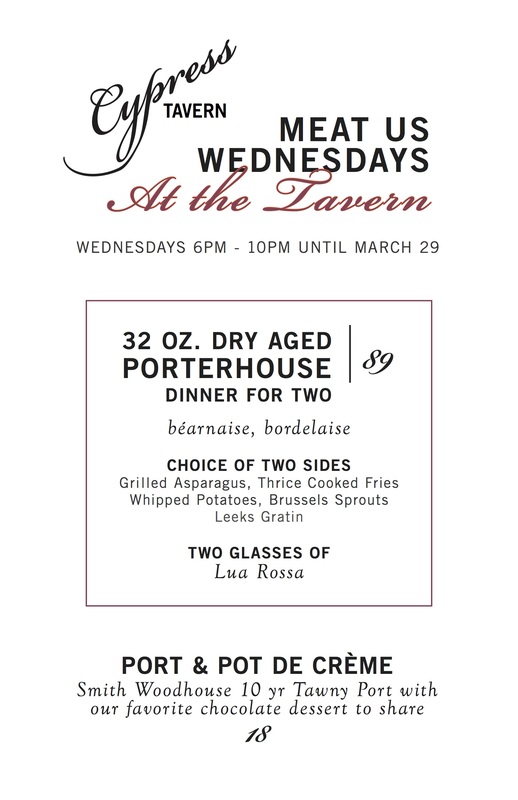 So gather some and head to Cypress Tavern because Wednesdays are now about upping the steak dinner game in a big, sharable way. Beginning next week until March 29, our guests can enjoy the restaurant’s signature large plate off the wood grill, a 32 oz. Dry-Aged Porterhouse, with a choice of two sides – Grilled Asparagus, Thrice Cooked Fries Whipped Potatoes, Brussels Sprouts or Leeks Gratin – with two glasses of Michael and Eric’s Nebbiolo blend with Jim Clendenen, Lua Rossa No. 4, for $89. $22 more will get a full bottle, a glass more each to go the distance. Because that’s what we would do. Chef Schwartz also recommends aficionados handle it like he would, with surf. Add a Wood Grilled Giant Prawn (PA) for the table, basted with garlic butter, seared off to a tender char and served with a cheek lemon to squeeze, the essential bright cut. Round out the experience with a healthy dram of Smith Woodhouse 10 yr Tawny Port to savor with Cypress’ decadent Chocolate Pot de Crème complete with soft whipped cream and sugar-toasted brioche for $18. Says beverage manager Amanda Fraga, “Dessert wines are kind of magic. When paired properly they can really enhance a dessert by adding a new layer of flavor. Here we add notes of caramel notes to the chocolate.” Brainer, no brainer. To reserve a table, email reservations@cypresstavern.com or call 305.520.5197. $5 Design District Valet is available, as well as street parking in the city lot in between 37th and 38th street. Full menus and more information are available at cypresstavern.com. Lua Rossa likes meat, too.